﻿ Real Madrid 3-0 Galatasaray. Highway to the semi-finals! 03.04.2013 » Real Madrid 3-0 Galatasaray. Highway to the semi-finals! The Merengues gave a giant step this Wednesday night, after running over Galatasaray by 3 goals to nil, at the UEFA Champions League quarter-finals first leg. Ronaldo became the competition's top goalscorer with 9 goals, after scoring the opener early in the game, which he did in great style. Benzema and Higuaín followed him in the scoresheet and if nothing extraordinary occurs in Turkey next week, Real Madrid will take one of the four semi-finals spots. It wasn't a vintage Real Madrid performance, but it sure was enough to virtually seal the deal in terms of deciding who moves forward into the Champions League semi-finals. Real Madrid clearly got the better of Galatasaray, beating the Turkish side by 3-0 and assuring that the trip to Istanbul next week will be made with a very safety cushion. As usual, Cristiano Ronaldo didn't let anyone down and opened the hostilities still inside the first 10 minutes. The lead would be extended further in the game though, thanks to goals from Karim Benzema and Gonzalo Higuaín. The two strikers seem to have responded well to that José Mourinho "calling" just a few days ago, where the Portuguese coach challenge his two forwards to start giving a more determinant contribution in terms of goals. One of the biggest challenges Real Madrid had ahead of this match was to complete the full 90 minutes without conceding a goal. That feat alone would mean a lot to José Mourinho's men, since the Merengues were yet to finish a game this season in the Champions League, without allowing the opposition to celebrate at least one goal. With Diego López extremely solid in the goal, Fábio Coentrão and Essien closing the space on the wings without compromising and Sergio Ramos and Varane playing at their top level, Real Madrid accomplished their first objective with success and held Galatasaray to a goalless game. We all know how important away goals usually end up being in these two-leg knock-out stages. However, it's also crucial to keep the sight on the opposition's goal and that's precisely something that comes natural to Real Madrid, especially when they have players like Cristiano Ronaldo in their ranks. 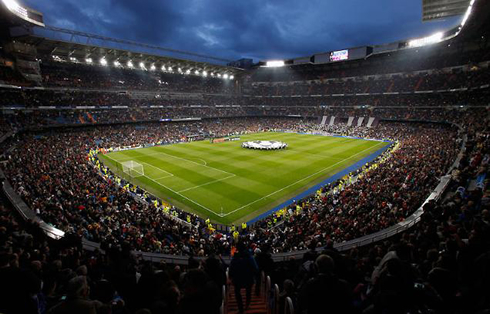 It took no more than 9 minutes for the Santiago Bernabéu to erupt in joy for the first time on the night. A brilliant teamplay involving Karim Benzema, Mesut Ozil and Cristiano Ronaldo, resulted in a spectacular finish from the Portuguese forward, as he chipped the ball above Fernando Muslera's body with extreme class. This was the 9th goal Ronaldo scored in this UEFA Champions League edition (out of 9 games played so far), and it immediatly made him the competition's top goalscorer, one goal ahead of Barcelona's Lionel Messi and Galatasaray's Burak Yilmaz. The Turkish striker will actually be forced to sit out from the second leg in Istanbul, after having been suspended for yellow cards accumulation. The first half still had another Merengues goal reserved, but this time it would be Karim Benzema hitting the back of the net. The Frenchman took advantage of a surprising passivity from Galatasaray defenders, as he calmly controlled a long cross performed by Michael Essien and struck the ball past Muslera, to make it 2-0 for Real Madrid. Too easy for the Merengues at that point, but there was still a long way to go before finishing the game with a result that would help assuring a more secure trip for the second leg match. The new clash between Galatasaray vs Real Madrid will take place right next Tuesday and José Mourinho surely knew how important it was to keep pushing and seeking a third goal. There wouldn't be any more differences in the scoreline until the break though and both sides headed back to the locker rooms with quite different feelings from the first 45 minutes. The Turkish side would return to the pitch in the second half with a distinct mindset and even though they never created much danger near Diego López's goal, they managed to get more ball possession than what they have had in the first half. Not that it would make much of a difference, since that was precisely what Mourinho intended in order for his team to be able to exploit those famous lightning counter-attacks. The third goal arrived in the 73rd minute and it didn't came from any fast attacking play though, but rather from a set-pieces play. Xabi Alonso took a free-kick on the left, put in a cross into Gatalasaray's penalty area with his trademark pinpoint precision and saw Gonzalo Higuaín corresponding with a terrific header. Once again, there was not much for Muslera to do in the goal and Real Madrid had just gotten the coveted 3-goal lead. After the 3-0 result was obtained, Real Madrid managed to discreetly clean their yellow cards record for a couple of players, as it was the case of Sergio Ramos and Xabi Alonso. The two players kind of forced themselves to be shown a yellow card in the final minutes of the game, which means they'll miss the Galatasaray vs Real Madrid second leg in Istanbul next week, but will have a clean record for the semi-finals and eventually the final. That is, if Real Madrid ends up confirming their high favoritism to get through in this round. Most sports bookmakers have even closed the odds for customers to bet on Real Madrid advancing to the semi-finals, which is a clear indication that no one is expecting for Galatasaray to still have a say in this quarter-finals round. 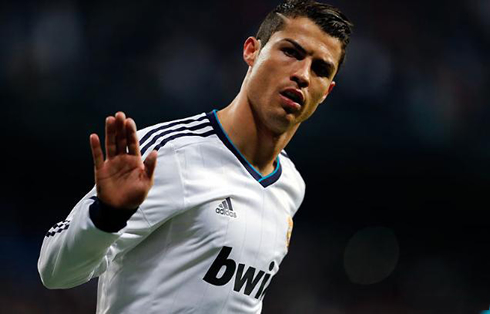 Cristiano Ronaldo next game for Real Madrid will be against Levante, on April 4, 2013, for the Spanish League. You can watch Juventus live stream, Real Madrid vs Levante, Benfica vs Newcastle, Chelsea vs Rubin Kazan and Tottenham vs Basel, all matches provided from our football live streaming section.